Because of [your] warm embrace of welcome, I quickly felt at home here. Therefore with a heavy heart I share with you this morning that my resignation as Bishop of Pueblo has been accepted by the Holy Father, effective today, June 13, 2013. For some time I have had health concerns that have made it increasingly difficult for me to remain in office as shepherd of this diocese. Out of love for the church and for the people I have served here, I have discerned it is best for me to step down. I have sought to be a good shepherd in these past years as I bore the great apostolic responsibility to teach, lead and sanctify the People of God in this local Church. In that work, I have been aided by the tireless efforts of our priests, deacons and religious; by the generous sacrifices of time, talent and treasure by catechists, lay ministers and faithful in every parish; and I have certainly been aided by your prayers and thank each and every one of you for those efforts in building up the Kingdom of God. It is work we have done together, and with God's grace, it will bear great fruit in the lives of those we have served. According to the diocese, what's being billed as a "farewell celebration" for the bishop is scheduled for 25 June with a cathedral Mass and reception. The event's description ostensibly points to the new retiree's return to Miami, where the 1.3 million-member fold could currently use an added episcopal presence given South Florida's ongoing lack of auxiliary bishops, both active and retired. As for the rationale behind the unusually sudden resignation, an op appraised of the situation indicates that the cause is not "at all" related to scandal, but to a significant, albeit quietly kept, health issue, which Isern is expected to address more fully in short order. 11.35am – In an unexpected move, at Roman Noon today the Pope accepted the early resignation of Bishop Fernando Isern as head of southern Colorado's 130,000-member Pueblo church. All of 54 now, the Cuban exile was a surprise pick on being sent to the sprawling Western seat in late 2009, a long way from his adopted home in South Florida, where he was serving as both a pastor and high school president. In the sole public comment on the move to date, a story from Catholic News Agency earlier this morning quotes an unnamed source in the Pueblo diocese as saying that, "in a spirit of prayerful reflection, the bishop recognized that his health may be an obstacle for the growth of the diocese" and that "he chose to resign in order to entrust his flock to a man with the strength and energy necessary to be an effective shepherd." That said, the announcement's timing in the middle of this week's USCCB plenary retreat in San Diego is exceedingly unusual, not to mention its departure from Rome's rarely exempted behest that – to the greatest degree possible – a diocesan bishop who seeks to resign citing illness remain in office until his successor has been duly provided. Just in the last six months, that standard early-out scenario has happened twice: amid years of well-known health trouble and the onset of dialysis treatment, Bishop Joseph Galante remained at the helm of South Jersey's Camden diocese over the year between submitting his resignation and the appointment of the New York vicar-general Dennis Sullivan to replace him in January. (Now happily settled at his longtime Shore house, Galante turns 75 on July 2nd.) Elsewhere, as he approached his 73rd birthday, Archbishop Jerome Hanus OSB of Dubuque stayed in post through the process that produced his successor, Michael Jackels, who was installed late last month. On his retirement, Hanus cited the lingering effects of a February 2012 accident on an icy Iowa road that saw his car roll over twice and prompted a lengthy recovery. 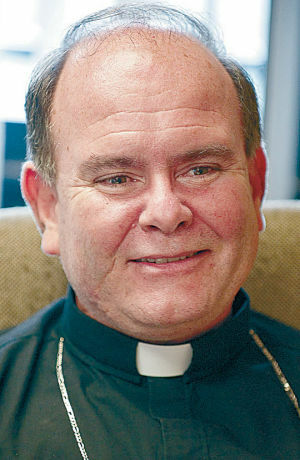 The last two occasions when a US diocesan bishop resigned purely due to illness without a successor in the wings came in March 2011, when Bishop John Ricard SSJ gave up the reins of Florida's Panhandle church of Pensacola-Tallahassee following a late 2009 stroke, and in early 2009, when Bishop John McRaith of Owensboro left office a year before reaching the retirement age of 75. On announcing his move, the latter prelate – a beloved figure who made his episcopal residence in a double-wide trailer – said that, while he wasn't gravely sick, he chose to heed his doctors' urging to "slow down" after 27 years of leading the close-knit Western Kentucky church. Before those, arguably the most memorable recent case of a successor-less resignation on these shores was in April 2008, as Bishop Donald Pelotte of Gallup stepped down six months after calling 911 from his home to report "gentle little people, about 3 to 4 feet tall, and wearing Halloween masks in the hall while Pelotte hid in a closet." Authorities located no unusual entry in the prelate's residence. That call came two months after Pelotte was found injured at the foot of a staircase in his house, with the official explanation citing a "fall" down them. In a rare gesture, Rome first placed Pelotte on a year's health leave months prior to his ultimate departure, naming an apostolic administrator to the New Mexico post, ostensibly in the hope of the incumbent's possible return. The first Native American to become a bishop following his 1985 appointment, Pelotte died in early 2010 at 64. Until this morning, no prior indication of health concerns – nor, indeed, anything untoward – involving Isern had emerged. The bishop had been scheduled to celebrate a Mass for the members of the Catholic press of North America at their annual convention next week in Denver. With the sudden resignation, the number of vacant Stateside Latin dioceses rises to eight as the Vatican's working year draws to its close. Back to the situation at hand, meanwhile, updates to come as the picture fills out.